Oh, I forgot to mention that there is now an easter egg in ProfilerQuery. See if you can find it! Sometimes a problem can lead to an "aha" moment. I suspected that I my local online list had been corrupted, and I knew that if I deleted (or rename) it, Profiler would download a fresh new online list file. When I opened the directory that holds the online list (Appdata\Local\DVD Profiler), my eyes fell upon two other files in that diectory; COOs.xod and localities.xod. 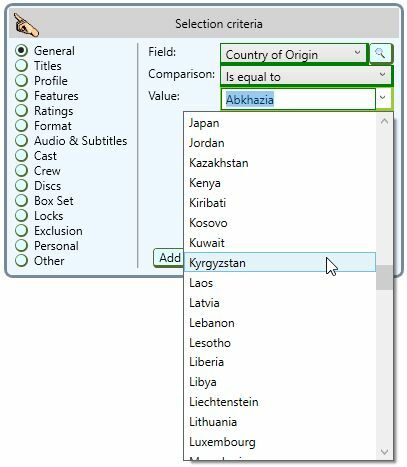 So my inner voice - the one that hasn't learned to shut up - asked me why I use hardcoded values for Country of Origin and Locality when I populate the dropdown lists in the selection. And my inner voice didn't wait for a reply, it said "Because you're stupid!". I have a rude inner voice. Anyway, I realized that my inner voice was (partly) right, so I set about to correct that limitation. So, the next time you're looking for titles from, say Kyrgyzstan, you don't have to remember how it's spelled. It'll be there for you to select. You probably won't see any difference in Localities. I think the hardcoded values covered all the current ones. But the upside is that if Ken ever adds new localities, you'll see them in ProfilerQuery. And the same goes for Countries of Origin, of course. By the way, if ProfilerQuery cannot find COOs.xod and localities.xod, the old hardcoded values will be used instead. I downloaded and installed the latest version today and it proved invaluable in identifying profiles in which Television was a genre. I had previously gone through my database but the program showed that i had overlooked about two dozen. I wasn't aware that it interacted directly with Profiler but at some point it let me know that Profiler didn't seem to be running. After starting Profiler double clicking on a list entry led me to the Profile in most but not all cases. I think where the associated Profile didn't display were those which I had manually entered. By selecting the tab that showed images no images were displayed but I was able to see the Title which was all I needed. Thanks for the great program! I'm glad that you found ProfilerQuery useful! Images are handled different from other data. Since they are not part of the exported XML, they are accessed directly from the local database. They are usually found at C:\Users\[username]\Documents\DVD Profiler\Databases\Default\Images. If that is not the correct path in your case, you need to go into Tools/Settings in ProfilerQuery and enter the correct path. Note that "Default" in the path is the name of the database. If your database is not named "Default" then you need to change that in the path. Same thing if your database is not stored in the standard location. That should fix the image problem. I'm surprised to hear that you have problems with manual profiles. I haven't heard that from anyone else, and they work just fine for me. Can you tell me what happens? 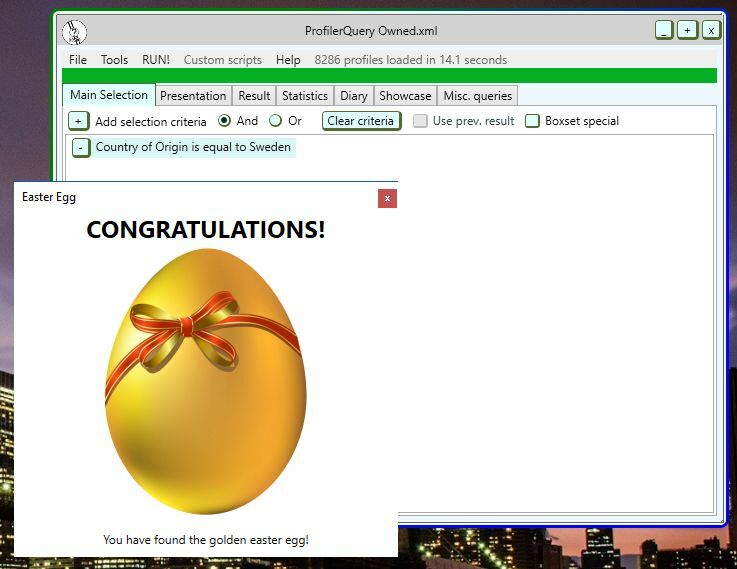 Does the Search by UPC box pop up in Profiler, but the correct profile does not get selected? Could you check if searching directly in Profiler works? For example, if the UPC for the profile shows as "Manual DVD #248", hitting Alt-F10 and entering "M248" (without quotation marks) and pressing OK should take you to the profile in question. Does it? Alt+F10 doesn't seem to do anything in Profiler. I have Win 7 64. After pressing when I hit "M" it just selects a Title that starts with "M". F10 brings up the Movie Pick screen which I noticed several times pop up when first checking out PQ. The DVD "Alf: Season 2: Disc 1" is a title that when clicked in PQ just goes to an incorrect title. I'll try to get more info and post when I can. Quick update. After posting and checking the images I see where I can type in the full image path. My eyes are not what they should be. I entered the full image path and now the images appear. Still have the problem that when double-clicking on a title an incorrect Profile is selected. I'm still looking for a pattern. It's not much of a problem. Profiler supports Custom media types and I've been using one to flag Profiles which were originally a Television production. I wasn't able to find a way to select a custom media in PQ. It would have come in handy. All in all a great program. Glad you got the images to work. And I'm glad you posted that picture of Settings, because it pointed me to a bug that I must have introduced somewhere along the line. Image directory should never be blank. It should have been populated with the default image path. So that's something I need to look at. I'm surprised that Alt-F10 did not bring up the Search by UPC box when you tried it. DVD Profiler has no actual connection to DVD Profiler, so it send keystrokes to mimic user input. And Alt-F10 is what it sends to bring up Search by UPC, and then it sends the ID (which would be UPC/EAN or Disc ID or Manual ID) plus Enter. So if Alt-F10 doesn't work then all searches should fail, and as I understand at least some of them do work, right? When you open the DVD menu in Profiler, one of the menu items should say "Search by UPC... Alt+F10". If you select that, it does bring up the Search by UPC box, right? And entering a manual ID, like M248, should select the profile in question. Does that work? Fixes a bug in the handling of Settings that was introduced a few versions ago. My apologies to Jim French and anyone else who might have been stung by that! The problem I had with the Alf DVD was caused by me only having a single disc from a box set. The pop up error window said it couldn't find the UPC. I downloaded the main Profile with the UPC and PQ found the disc. I'm using DVD Profiler Ver. 4.0.0 Build 1762 and Alt-F10 does nothing. I haven't checked this out fully but when I run PQ the first time after I've done a new export a new scan of the data is initiated and at this time the Movie Pick window appears and the result is saved. No problems with searches until new data is imported. F10 does open the Movie Pick window and a scan does take place. When the export is done without selecting the cast to be included any searches involving Cast will not work. Seems obvious what's going on here. No keystroke emulation here. I'll keep checking things out. But the DVD menu says Alt+F10, doesn't it? Well, I guess that explains why that doesn't function. @jfrench, you have lost the menu item. If you want it back, right click on the DVD tab and select customize. When the customization dialogue comes up, click on the DVD menu, scroll down to Select by UPC, and then drag and drop the menu item to anywhere you want it - ideally on the same menu tab that GSyren expects it. Then you should be good to go. So, losing the menu item also disables the shortcut? I didn't realize that. I had an inkling that one could customize the menus, but I didn't know how. It's not exactly intuitive.